Los Angeles pop rockers Smallpools just released their debut album earlier this titled LOVETAP! , but the band has been building buzz over the last few years. The band will hit the road in support of the album this fall and will come to the Triangle. 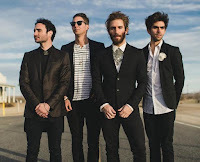 Smallpools will play the Cat's Cradle in Carrboro on Monday, October 12. Phoebe Ryan and Machineheart will open. Tickets will go on sale at 10 a.m. today, July 31, via Ticketfly for $20. Check out the music video for "Karaoke" from the album LOVETAP! below.